Which way will Left Unity go? Will this report save NHS emergency services? On 21 November, London Underground announced plans to close all its ticket offices and cut nearly 1,000 station staff posts. Passengers and trade unionists responded with immediate opposition: within hours of the announcement, disabled campaigners held an impromptu protest at Westminster station, and the RMT trade union announced an industrial action ballot. 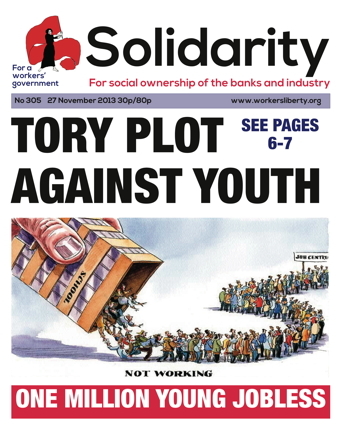 Trade union activists targeted blacklisting employers on a 20 November day of action. The day, which was called by the TUC, saw demonstrations, rallies, and other direct actions targeting companies such as Sir Robert McAlpine, a construction firm. An ongoing parliamentary enquiry has revealed that the firm spent £28,000 on union-busting and blacklisting activities. Demonstrations were held in Birmingham, Cardiff, Glasgow, Hemel Hempstead, London, Leeds, Manchester, Newcastle, Wolverhampton, and elsewhere. The steering committee of the Local Associations National Action Campaign (LANAC), a rank-and-file network in the National Union of Teachers (NUT) met on 23 November in Nottingham. Higher education workers will strike over pay on 3 December. Members of UCU, Unite and Unison in higher education who struck on 31 October will be striking again. This time they’ll be joined by Scottish education union EIS and UCU members in further education. Many university teachers get less than the minimum wage, as little as £4 an hour, for the work they put in. Some are beginning to organise. Josie Foreman discusses the issues. Academics love nothing more than having a moan about the terrible state of the neo-liberal university. We tend to be slightly less enthusiastic when it comes to getting up from our desks and doing something about it. This has begun to change, as pockets of resistance have begun to emerge at several different British universities in the last few years. Present-day schools teach failure more than they teach anything else. They are inefficient at teaching knowledge. A recent survey found that MPs and business bosses, despite mostly having had many years of schooling, can’t work out the probability of getting a head and a tail when a coin is tossed twice; and we all know that many of them cannot write adequate English. Yet, by the time they have finished school, most young people will have had one big idea drummed into them: that they are failures. If you want to know the truth about North Korea there can be no better starting point than this excellent book by award-winning BBC journalist John Sweeney. North Korea is one of the most repressive and totalitarian states in the world, but it is a state as bizarre as it is repressive — like a Kafkaesque nightmare combined with Orwell's 1984 and Alice in Wonderland. Even though it’s a cliché, I did laugh and I did cry while watching Catching Fire, the thrilling second instalment of the film series based on Suzanne Collins’ The Hunger Games trilogy.. It was amusing, emotionally-touching, and it really can set a fire in your belly. A decade ago the Scottish Sunday Herald had a circulation of over 60,000. But now it has sunk lower than 25,000. A decade ago Paul Hutcheon was an investigative reporter. But now he just hunts with the pack. Could the decline in the paper’s circulation be related to the decline in the quality of its journalism? “Leading Labour MSP Urged to Resign After Taking Part in Unite Demo Outside Director’s House,” read the headline above an article by Hutcheon last Sunday.